DrumsOnTheWeb.com page... Drum Key - Manufacturers & Industry News - 9000 Series "Floating Rotor" Bass Drum Pedals from Drum Workshop. Following the overwhelming popularity and success of its limited edition 9000 "Titanium" bass drum pedals, Drum Workshop proudly announces the introduction the DW 9000 single and 9002 double bass drum pedals. The new, production line series offers the Titanium’s exclusive floating rotor and independent drive shaft along with a full complement of the limited edition’s revolutionary innovations and progressive designs as well as the many of performance-proven features of DW’s current state-of-the-art 5000 Series Delta II pedals the legendary pedals that were selected as the Most Valuable Products by the readers of Modern Drummer Magazine in the magazine’s last two consumers polls. Free-Floating Rotor and Independent Drive Shaft  To create the pedal’s incredibly smooth action, the rotor is not permanently affixed on a horizontal drive shaft but is mounted on an free-floating drive shaft using friction-reducing ball bearings. In addition, the 9000 rotor can be infinitely adjusted in a variety of positions from center (Turbo-style) to eccentric (Accelerator-style) to achieve the desired balance of power and precision in any playing situation. Free-Floating Spring Assembly  By moving the location of the spring from the end of the hex shaft to the center of the pedal, and maintaining the vertical alignment of the moving parts, the indirect transfer and loss of energy is virtually eliminated further optimizing the pedal’s speed and smoothness. Delta-Plus Multi-Bearing System  In addition to DW’s Delta ball bearings at the hex shaft and hinge, the 9000 utilizes friction-reducing ball bearings in the rotor, rocker and spring connector. 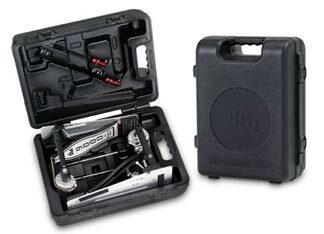 Heavy-duty Molded Pedal Case  The 9002 includes a custom-designed, injection- molded case with special compartments for pedals, beaters and accessories. The 9000 Pedals also incorporate several of the 5000 Series’ most popular upgrades, such as a stackable heel plate, dual/side adjusting hoop clamp, 101 two-way beater, built-in spurs and lightweight aluminum pedal plates and linkages. 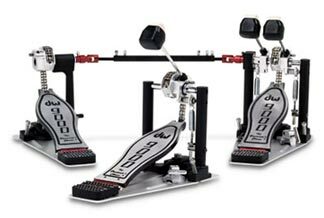 Test drive the new 9000 Series bass drum pedals along with DW’s award-winning 5000 Series at your local authorized DW dealer or contact Drum Workshop, Inc. at 3450 Lunar Court, Oxnard, CA 93030, USA, tel: (805) 485-6999, fax: (805) 485-1334, internet: www.dwdrums.com.